"These pretty Valentine's Day cookies can be decorated in so many ways--icing, sugar crystals, piped messages. A sweet little treat for that special someone." Line cookie sheets with Reynolds(R) Parchment Paper; set aside. No need to add extra grease or spray your cookie sheets. Knead flour into sugar cookie dough until well blended. Roll out half of cookie dough at a time to 1/4-inch thickness between lightly floured sheets of Parchment Paper. 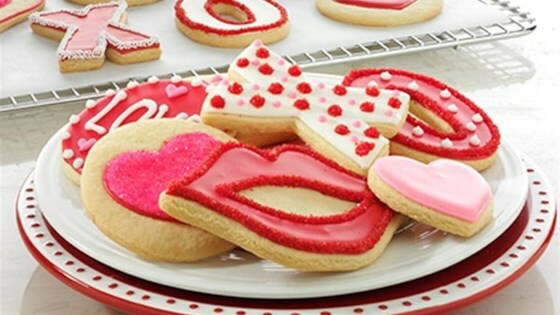 Using Valentine cookie cutters, cut out cookies; place on parchment-lined cookie sheets. Icing and Decorating: Beat powdered sugar, meringue powder, water and extract in a large bowl, with an electric mixer, on high speed until smooth and thick, about 1 minute. REYNOLDS KITCHENS TIPS: --Cover icing at all times. Icing can dry out quickly. --Let icing dry before adding a different color of icing. If icing is still wet, colors will blend.